This character was created and written by James Waley with the visual portion done by Gene Day, Vince Marchesano, Wendy Fiore Bill Payne and P. Iro. The story was sold to Charleton Publications Inc. by Waley’s Controlled Chaos Productions. The story was begun in 1976 possibly for Waley’s Orb magazine. Front; Co-illus., Gene Day & V. Marchesano. Charlton Bullseye, 2-9, Sept. 1982. “Bludd The Ultimate Barbarian.” Writ., James Whaley. (Illus., pages 2-8, 1976, Gene Day.) Pen., V. Marchesano, In., Gene Day. Co.l, Wendy Fiore. Let., Bill Payne & P. Iro. Charlton Bullseye, 9, Sept. 1982. 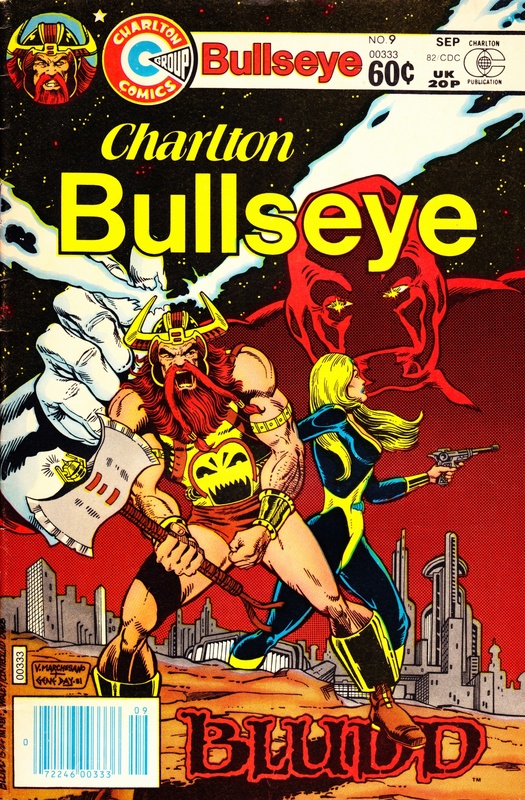 Charlton Bullseye, 2-9, Sept. 1982: Front cover.